iMuscle's anatomical models look a bit leaner than I had in mind. I saw my six pack for the first time at the age of 40. Prior to that, my abs had been hidden behind a thick layer of fat that I’d built up over years of living a sedentary geek lifestyle. The only exercise I got was racing to be first in line at the Apple Store for a product launch. Then one day, a doctor told me I had cancer and my whole world changed. There’s nothing like a brush with death to make you take your health more seriously. Suddenly, I wanted to get fit, but true to my geek heritage, I would do it using my iPhone. Abs? There must be an app for that. Fortunately for me, as I mentioned in Part 1 of this series, my chemotherapy was successful. I had been blessed with a rare second chance in life, and I wanted to make the most of it. Initially, I started running with Nike+, but it was making me look skinny rather than healthy. So I decided to join a gym and start bulking up, as I described in Part 2. A personal trainer at my gym told me I needed to quit running if I was going to make any serious gains in muscle size. But I loved running and I didn’t want to give it up. So instead, with the help of some great iPhone apps, I found a balance between running and weightlifting that worked for me. As every geek knows, e=mc2. Energy and mass are intrinsically linked. The more energy we consume (in calories), the more mass we gain (in pounds or kilos). As Scotty would say, you cannae change the laws of physics. So all my effort at the gym would be wasted if I didn’t get my nutrition strategy right. 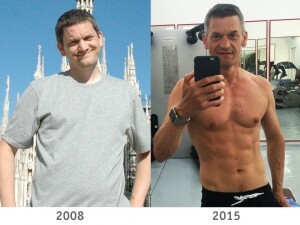 I was losing weight because I was not eating enough energy to fuel my daily 7-mile runs. Now I had added gym sessions on top of the running. Far from helping me bulk up, this would just burn more calories, making me lose even more weight. If I was going to carry on running, I needed to start eating more. But what should I eat? It is now easier than ever to improve your eating habits, thanks to iPhone apps like MyFitnessPal that enable you to maintain a journal of everything you eat. MyFitnessPal’s encyclopedic database contains practically every food product you can buy in a supermarket, and you can scan bar codes with your iPhone’s camera to automatically add them to your journal. Initially, I used MyFitnessPal to work out how many calories I was eating on average each day, and which macronutrients, or “macros,” these calories were coming from: proteins, fats or carbohydrates. MyFitnessPal is designed for continuously logging your diet, but I tend to eat the same things every week — it would be repetitive, time-consuming and pointless to keep logging this over and over again. Instead I found it was only necessary to log seven days of eating to work out what was going on. Now, if I make any significant changes to my diet, I do another seven-day food journal just to check that I’m getting the right balance of macros. I’m a vegetarian, but apart from this, I didn’t follow any specific diet. Instead, I just increased what I was eating overall, while cutting out junk food and supplementing my protein consumption with plenty of eggs and whey. MyFitnessPal provides you with targets for the macros you should eat, based on your current weight and goals. While this is a useful guide, I did not follow it very closely. Instead, I made small adjustments to what I was eating and tracked the impact that these changes had on my weight and body composition. (See last week’s article for more on body composition). iMuscle 2’s animated database of exercises can help you make all the right moves. As I got to know people at my gym, I discovered that the guys with the most impressive physiques were usually the ones who knew the most about anatomy. Sure, most of us know our pecs from our abs, but these guys knew their sartorius from their vastus medialis. I realized that if I was serious about building muscle, I would need to start by building some serious anatomical knowledge. And it doesn’t get much more serious than Muscle System Pro III from 3D4Medical.com. 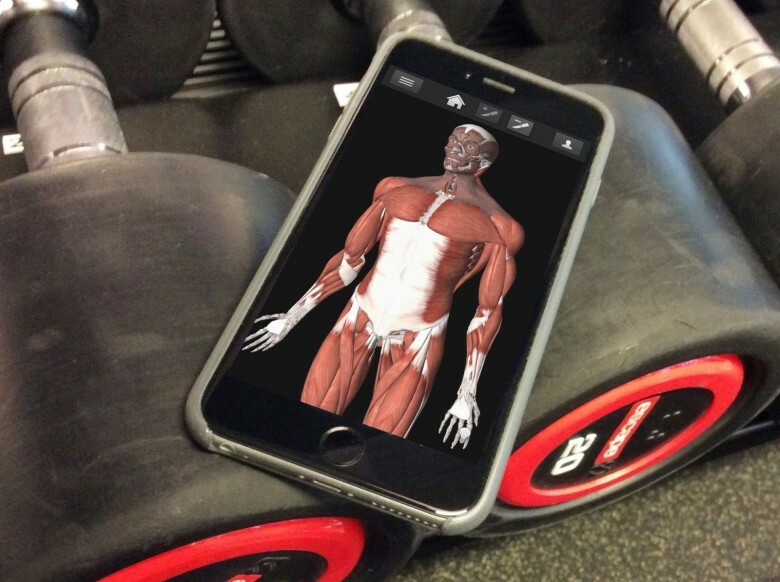 Designed as a study aid for medical students, this iOS app provides interactive 3-D models of every major muscle group. Muscle System Pro III provides excellent animations to illustrate the function of each muscle. It also identifies the origin and insertion point, which tells you how a muscle connects with the skeleton, and which joints it will move. With this knowledge, you can work out for yourself which exercises will train a particular muscle. Unfortunately, if you don’t know many exercises, Muscle System Pro III can’t help you. For this, 3D4Medical.com offers another app called iMuscle 2. While iMuscle delivers less technical information about muscles, it packs a great animated database of exercises, plus a much nicer and more intuitive way of interacting with the 3-D muscle diagrams. It is a shame that 3D4Medical.com has not combined the best features of both apps — I would happily pay more than twice the price for an app like that. Apps like Nike+ and Strava are great for tracking running workouts, but they are no help when it comes to logging a weightlifting session at the gym. The trouble is that while GPS provides a simple way of tracking how far and fast you run, there is no equivalent for tracking how heavy you lift. Some weight-resistance machines, like those from TechnoGym, offer automatic counting of reps and sets, which can be synced to your profile, but you still have to enter the weight manually. At Google I/O 2015 last month, Google introduced automatic logging of squats, sit-ups and pushups for Android Wear users. But ultimately, whatever system you use, you will have to do some manual data entry. Initially, I logged my weightlifting sessions using the Notes app on my iPhone, but this was cumbersome, so I looked for alternatives. There were many gym-logging apps on the App Store, but none of them did exactly what I wanted. As I learned more about weightlifting, I wanted to log not just the exercises I was doing, but also the rest intervals, dropsets and supersets. And as a user interface designer, I had been keen to design an iOS app. 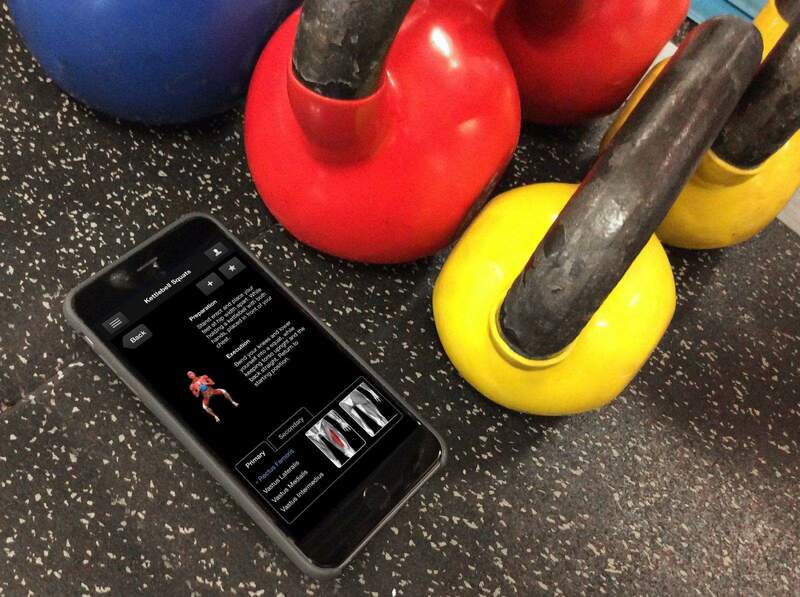 So with my partner, Martin Algesten, we developed our own gym-logging app called Reps & Sets. I’ve been using it to log my gym sessions ever since. My desire to get fit and healthy after successfully completing cancer treatment has taken me on a long journey. I discovered a passion for running and ran halfway around the world (20,000 kilometers on Nike+). I became a qualified personal trainer and started a new career as an iOS fitness app developer. During this time, my body has changed a lot too. I have lost my middle-aged gut and put on a fair bit of muscle. But there is still a lot I want to do. Apps and gadgets have played a very important role in my journey, but even more important for me has been learning to manage my mental state so I can stick to my training program. You can read more about the techniques I used here. The kind of cancer I have can’t be cured — it is just in remission. Last year, a nasty flare-up in my skin made it impossible for me to run for several days. That was a painful reminder of how this whole journey started and why it is so important for me to continue. I was very lucky that the chemotherapy saved my life in 2007 and I am grateful for every day that I am able to train. It is that gratitude, more than any app or gadget, that keeps me going.